As far as countertop ovens go, the NuWave is one of the most reliable and versatile machines out there. It can roast, bake, broil, fry, and grill, all without taking up too much counter space or electricity. Best of all, because the NuWave Oven doesn’t need oil to cook your food, you can make much healthier dishes that will keep you and your family satisfied. To help you understand how your NuWave Oven works, let’s go over the various components that make the system run smoothly. Each piece is designed for a particular purpose, so it’s imperative that you know exactly how it operates. Overall, this oven is designed to be as simple and convenient as possible. This is the most crucial part of the NuWave Oven as it is what contains the heating element and control panel. Simply put, without the power head, you won’t be able to do anything with your NuWave system. How does NuWave Oven works? It cooks food using three different heating systems simultaneously. This part is a key to generate conduction, infrared and convection heat. It includes a heating element, infrared rods, and a convection fan to blow the heated air around your food. Since there are so many intricate parts in the power head, this is the component to treat with the most respect. Also, if you are having issues with your NuWave, the power head may be the problem, meaning that you can order a new one to fix it. Since the power head uses infrared rods instead of a halogen lamp or heated coils, it’s much safer than most other countertop ovens regarding burns and fire hazards. However, these rods are somewhat sensitive so the whole unit should be handled with care at all times. The power head also contains the control panel where you can set your time, temperature, and cooking method. You can either get a digital or an analog system, but it seems that digital is by far the best way to go as it will last much longer overall. The power head in a picture above is of NuWave Oven Pro Plus. You can set a temperature between 100 and 350 degrees Fahrenheit and can change the temperature on this head in one degree increments. Finally, there is a small motor inside to power the convection fan. This fan is essential because it ensures that the heat is distributed evenly throughout your food, meaning that if it stops working, you may need to replace the whole thing. While you could try to fix the fan itself, it will require more specialized tools and training to make it work. Considering that the power head is not too expensive, you’d be better off buying a new one instead. This is the section that covers your food and enables it to cook quickly. As the heated air circulates through the dome piece, it gets quite hot, which is why the whole thing is made of tempered plastic rather than glass. According to the manufacturer, plastic is much safer overall since it won’t fracture or shatter, particularly if dropped. The dome is designed to withstand impacts and not break, which can be a valuable option if you plan on storing your NuWave on a regular basis. If you are considering buying a NuWave Oven, pay a little more money to get the NuWave Oven Pro Plus or NuWave Countertop Elite Dome Oven which come with a shatter-resistant power dome. It is last longer than that of NuWave Oven Pro. The inside of the dome is tinted to help reflect more heat inside and make the oven more efficient. It has a relatively large capacity so that you can cook a lot of food at once, and it is dishwasher safe so that cleaning is a breeze. Unfortunately, even though the plastic is tempered, the dome does tend to crack over time. This is because the intensity of the heat can damage the structure of the material, forcing it to expand and contract much more than it should. Overall, you should expect to replace your dome every couple of years or less. This component is simply what you use to hold the liner pan and the dome. For the most part, your base will last longer than anything else because it does not undergo the same wear and tear that other pieces do. One neat feature of the base is that it stays cool to the touch, even while cooking. This helps prevent burns as well as makes it a viable option as a serving tray if you want to minimize the amount of dishes you use when cooking your next meal. If you want to make large dishes such as a whole turkey or ham, then you will need this piece. The power dome is only so tall, so this ring adds another three inches to the overall capacity. It sits between the base and the dome and will last forever. Since it is metal, it won’t break or wear down as quickly as the dome, so it should stick around as long as the base. If you are looking for information to buy your first NuWave Oven, you can buy the extender ring together with the oven at once. Here are the two models that come with the ring- NuWave Oven Pro Plus with Stainless Steel Extender Ring and NuWave Countertop Elite Dome Oven with Extender Ring. To help keep your base clean and prevent wear and tear, you need this liner to sit on the bottom and hold your food. This component is also designed to hold your cooking racks to keep them in place. The liner pan is enameled so that it won’t stick to your food, and it also makes it much easier to clean. As with the base and the extender ring, your liner pan should last for years without developing any problems. The only thing that may stop working well is the non-stick coating as it could start to peel off over time. Related: How Can You Use a NuWave Oven? If you want to make multiple foods at once, then you will need this cooking rack to do so. 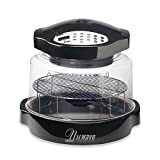 This piece enables you to place different items inside the dome without them touching so that you can maximize your NuWave’s cooking potential. The rack is made of metal, and it is also reversible so that you have more options when using it. For best results, use the cooking rack in conjunction with the extender ring so that you have even more space. Cleaning is also a breeze since it is dishwasher safe. Each of these components is available for individual sale so that you can replace them as needed during the life of your oven. Also, because the whole thing breaks down into separate pieces, it is much easier to store when necessary. You can buy these pieces online from NuWave directly, meaning that you can keep your oven in pristine condition forever.